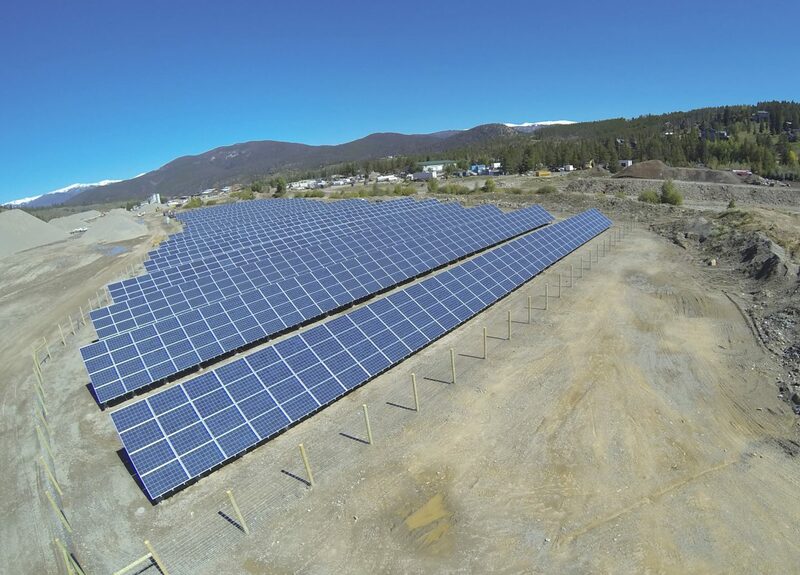 This is one of two solar gardens installed and maintained outside Breckenridge by Clean Energy Collective. Steamboat Springs — The Routt County commissioners placed an emphasis on the goal of transitioning to “future energy economies” in their recent strategic planning process, and they already oversee a significant solar array on top of the Routt County Justice Center on the west side of Steamboat Springs. But they weren’t ready Monday to tell Facilities Director Tim Winter to continue to explore investing in the new community solar garden that Clean Energy Collective is planning to begin constructing next month in Craig in collaboration with Yampa Valley Electric Association. CEC is a for-profit company that has built similar community solar arrays in Colorado mountain towns. The company allows individual households to spend as little as $850 on a small portion of the larger solar facility, in order to offset a portion (or all) of their electricity usage without having to invest thousands of dollars to put their own grid on top of their homes. The solar garden offers the added benefit of being ideally situated on its planned site for optimal solar gain, something that rarely, if ever, is achieved on an existing home. Commissioners Steve Ivancie and Doug Monger said they were uncomfortable investing public dollars given CEC’s unwillingness to share with them some of the financial details involved in building the solar array. “The lack of transparency here, and that it’s not allowed for the public to view the contract, that is a non-starter for me,” Ivancie said. “There are too many loose ends for me,” he said. “We aren’t allowed to see the contract. The public’s not allowed to see the contract. We aren’t allowed to see the cost. I’m fine with not” going forward. Commission Chairman Tim Corrigan said he was reluctant to jump into the solar garden with county funds before the commission has prioritized a number of different alternative energy items — vehicles that run on compressed natural gas, for example. He also referred to a Sunday article in The New York Times that pointed out that the price of solar panels has dropped steadily. Corrigan wondered if the county might not feel some buyer’s remorse if it buys into the solar garden at today’s prices, only to see them fall further in the near future. Winter almost persuaded Corrigan that future price drops wouldn’t matter if the current price resulted in a net energy cost savings throughout the next five years. He pointed out that seven years ago, the county paid $8 per watt for solar panels on the Justice Center and since has recouped $60,000 in the form of renewable energy credits from Xcel as well as $24,000 in reduced electric bills. The pre-construction price being quoted by CEC this fall is as low as $2.75 per watt when a 30 percent tax credit is factored in. “If you can make an investment that is going to more than pay for itself, do you want to wait and see if you can do better in five years?” Winter asked. Monday’s discussion was informal, and the commissioners noted that according to Winter, they have until the completion of construction on the solar garden, likely December, to take advantage of pre-construction pricing, should their position change.